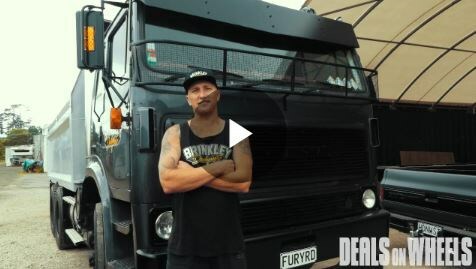 Deals on Wheels recently took a trip out to Luke Brinkley’s West Auckland yard to take a look at his operation and have a chat about what it is that interests him in old-school trucks like his flagship vehicle, a T Line International. You’d have to travel a very long way indeed to find someone with as much enthusiasm and drive as Luke, who says he’s been interested in trucks and machinery for as long as he can remember. He says his mentor, uncle John Fransen, operated a 25-tonne Liebherr on his Morrinsville farm in the 1990s. Luke says this was the catalyst that sparked his interest in excavators when he was only eight years old. His passion for International Harvester trucks and machinery was forged at the same time, as his uncle owned an International tractor that Luke preferred to the farm’s other tractor, a Nuffield. 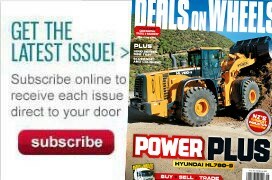 It wasn’t always a given, though, that he would wind up in the contracting business. In his younger days, he served his time as a sheet-metal fabricator and also did a stint in building and construction before studying to become a fitness trainer. However, memories of dirt and diesel smells from Luke’s formative years eventually won the day over the odours of the gym, and by June 2015, about the time of his thirtieth birthday, Luke had bought his first truck and machine, a 1996 Ford Trader and a 1.5-tonne Yanmar digger. He says the little Trader, sourced from Northland, was in pretty bad shape, but it was reasonably priced and certainly good enough to give him a start in the contracting game. Not being content with driving around in an untidy truck, he set to work making it presentable. 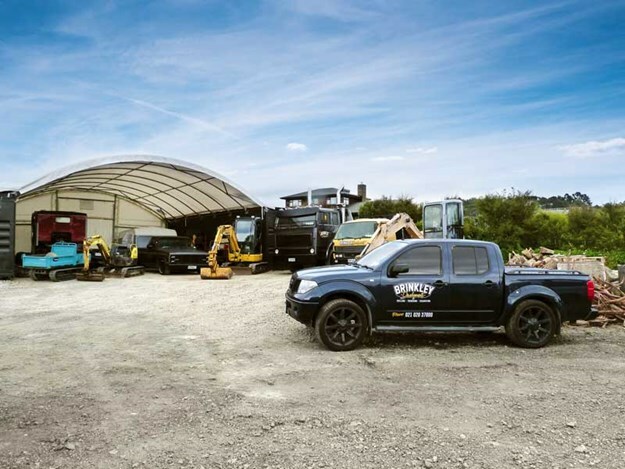 The truck still looks very tidy and holds pride of place in the Brinkley Developments fleet, although Luke says its yellow livery is about to be replaced with the new grey and satin black corporate colour seen on the T Line. 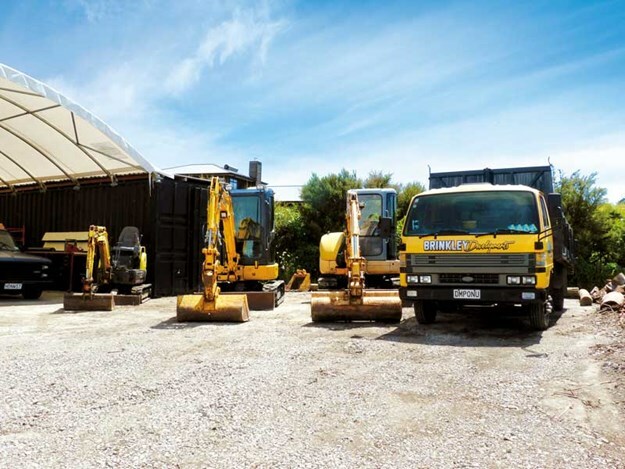 But Luke’s an avid Komatsu fan, so all machines in the Brinkley Developments fleet will remain Komatsu yellow, which serves the dual purpose of being safe and highly visible on worksites. Luke reckons the huge amount of work involved in bringing his purchases up to the level of serviceability that meets his standards doesn’t faze him, and the extra effort is well worth the sweat. He is very keen to have his fleet looking spick and span. For example, when he bought the International from a company in New Plymouth, it was painted grey, but it had white wheels and other trim that didn’t quite portray the image he had in mind for his firm’s livery, hence the change to the satin black trim. As well, the black plastic air rams and stainless-steel exhaust stacks weren’t up to his standards, so he replaced them with new stainless-steel straight pipes with stainless-steel air rams on top, and he used brand-new brackets, bolts, nuts and washers. Also, taller, larger-diameter exhaust stacks were fitted, as was a custom-built sun visor and the distinctive FURYRD personalised registration plates that Luke says were inspired by the Mad Max series of films. The Inter is powered by a 350 Big Cam Cummins, to which Luke has fitted a slightly larger Holset turbocharger, giving it a bit of extra grunt. Brinkley Developments does a lot of work at Piha, a beachside settlement that sits at the bottom of a 250-metre cliff with a very steep gradient in and out. This is one of the situations in which Luke says the Big Cam Cummins comes into its own. He says he’s spent hundreds of dollars on screws, bolts, nuts and washers, some of which he’s sourced from Australia because he couldn’t get exactly what he wanted in New Zealand. Everything that came off the truck was replaced with bigger, better, stronger parts, he says—absolutely everything. He was so pleased with the finished product that he took the Inter to the 2017 Truck and Machinery Show, where it was runner-up for the People’s Choice award. 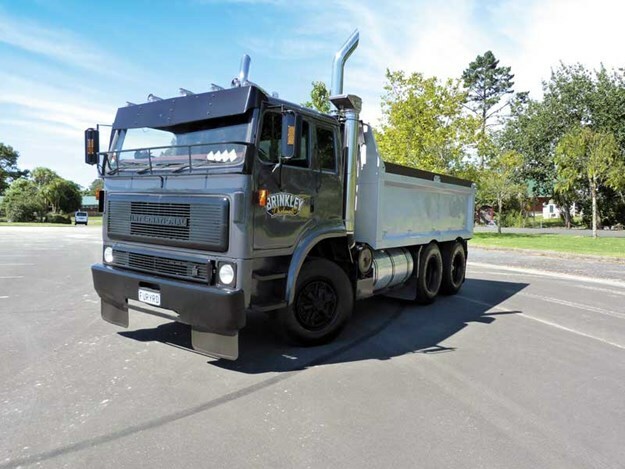 After giving the truck a few more upgrades, he entered it again at the 2018 show, where it took out first place in the tip-truck category. While it would be easy to give Luke, a self-confessed workaholic, all the credit for his first-class restorations, he tips his hat to his partner, Courtney Spinetto, and his many suppliers and support people for effortlessly keeping the wheels of the business turning. 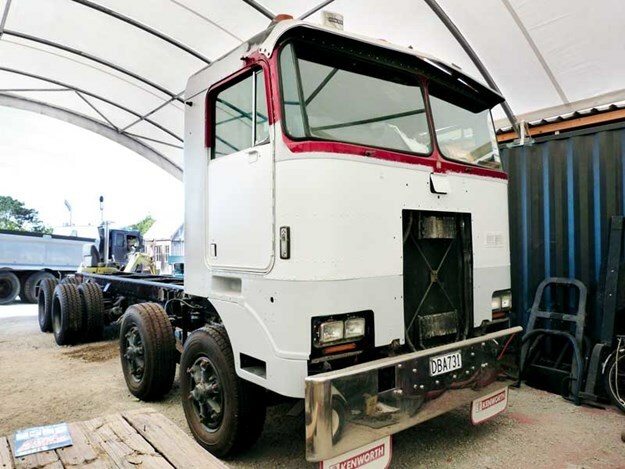 Luke’s love of old-school trucks is further reflected in his current project, the transformation of a Kenworth K100E eight-wheeler into what will be a most impressive transporter. It will have the registration plate FURY2, in keeping with the Mad Max series theme. Luke bought the truck from a man in the South Island. It was fitted with a flat deck, which he removed as soon as it arrived in Auckland. He sold the deck and put the money straight into the truck’s restoration. Getting the cab and chassis into shape was a fairly arduous task, he says, as the entire rig had several coats of thick paint that had to be meticulously taken off prior to repainting. All 12 tyres were removed from the rims and the wheels were sandblasted and painted before new low-profile tyres were fitted. These and a lowline deck—which is under construction and will have an easy-raking dovetail coupled with extra-long ramps—will allow the unit to load anything from a lowered car to large excavators. To add versatility to its capabilities, the truck will have twist locks added, enabling it to carry 20-foot containers. It will also be plumbed and have mountings put in place for the eventual inclusion of a truck-mounted crane as finances allow. Luke says the little Ford Trader also performs a crucial role in the fleet because of its reliability and manoeuvrability in tight-site situations. It’s easily capable of carrying a three-tonne load and has a strongly built tipper body and hoist, he says. 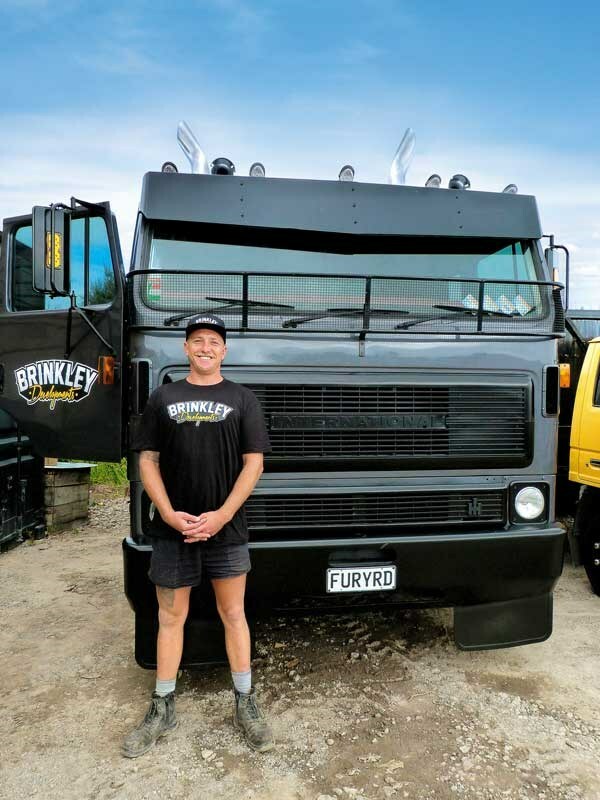 Once the Trader is painted in dark grey and satin black to match the T Line, and the K100E is put to work in the new Brinkley Developments livery, an impressive fleet of trucks will be gracing the highways and byways of Auckland.